Housing price indices could continue to fall without better news from the Bureau of Labor Statistics. NEW YORK ( TheStreet) -- After a disappointing 9.1% unemployment rate was reported earlier this month by the Bureau of Labor Statistics, it's no wonder housing prices dropped in the S&P /Case-Shiller 20-city composite indices released last week of first quarter home sales. But will the housing market rebound in the near future? "Housing price indices nationwide are hitting new lows, driven by sales of distressed homes, which comprise 28% of all sales according to RealtyTrac," says Wharton Real Estate professor Susan Wachter. "There is some price firming in non-distressed sales, but with foreclosures feeding shadow supply inventory, a solid bottom is not in sight." 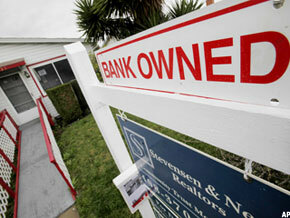 The foreclosure problem is deeper than current foreclosure listings and expected delinquencies. With traditional foreclosures, likely defaults can be anticipated using mortgage statistics on borrowers' number of months past due. It's therefore relatively easy to make predictions on when these foreclosures would drop in numbers. However, there are a growing number of people exercising the foreclosure option by choice due to a relatively new phenomenon. Nearly one in four Americans were underwater on their mortgage in the first quarter of this year according to a recent CoreLogic Q1 2011 negative equity report. In two states, Nevada and Arizona, more than half of mortgaged homeowners have negative or near negative equity. The national average for those with negative equity is more than $60,000, although the average varies widely by state. For instance, New York borrowers in this situation have mortgages averaging more than $120,000 over their home's market price. The number of individuals who owe more than what their home is worth creates an X factor of strategic defaulters who could walk away from their homes due to fear of economic loss in the future. If significant numbers of these homeowners walk away, raising the number of properties on the market, prices will decline even further and cause greater numbers of these defaults. Wachter notes that attempting to estimate when foreclosed homes will be bought and absorbed back into the traditional housing market is not the answer. "All bets are off when continuing falling prices increase shadow supply by relatively unknown amounts -- unknown in part because we do not understand the likely behavior of strategic defaulters as default becomes more common." Unfortunately, the unknown factor can't be reduced until housing prices rise, creating as Wachter puts it, a "chicken and egg dilemma." She says, "Once prices firm, the spigot of new foreclosures will close and the market will have visibility to estimate absorption of current inventory and shadow from the REO (Real Estate Owned) process." However, there are economic predictors that will spur housing market recovery. As job growth occurs, and potential home buyers feel more employment stability, purchases will increase. The trend will continue as inventory shrinks and housing prices are driven up. But without a drop in unemployment, don't look for that scenario. Housing price indices could continue to fall without better news from the Bureau of Labor Statistics.